Ramen's popularity has only grown in the U.S. since David Chang popularized the Japanese noodle soup in 2004. But do you really know what you're eating? WASHINGTON — When you order a bowl of ramen, it’s best to forget Emily Post’s guide to etiquette. For starters, there’s no need to wait for others at your table to be served before you dig in. The second your bowl is set in front of you, it’s game time. 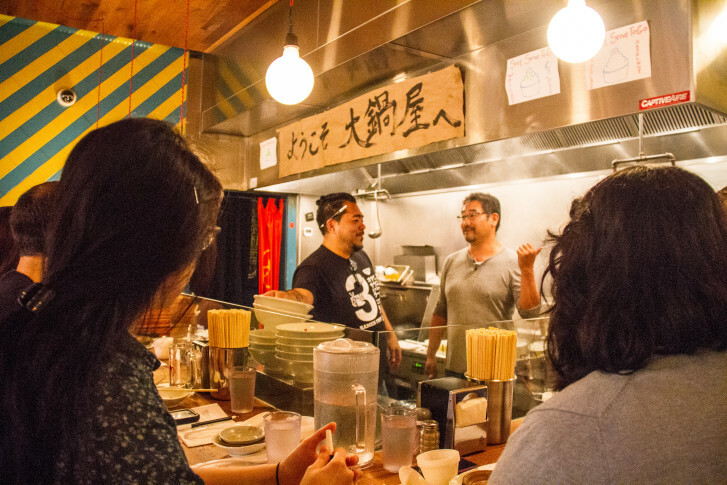 “The basic ideal of table manners in Japan is to pay respect and appreciation to the makers of the food,” says Daisuke Utagawa, a partner at D.C.’s ramen shop Daikaya. And one way to do that is to eat ramen when it’s hot and the noodles are at their optimal consistency. Second: Forget the spoon. Sure, you can use it later in the meal, but the first taste should be a big gulp of broth directly from the bowl of steaming soup. Utagawa says to “get your face in there,” and make use of all of your senses for the full experience. Finally, slurping is encouraged. Fill your chopsticks with noodles and slurp up the curly, broth-covered ribbons as quickly and as loudly as you can. Just like pouring wine through an aerator helps to soften the flavors of the tannins, slurping ramen accentuates each ingredient in the dish and helps to cool down the hot soup before it hits your tongue. Now you’re ready to eat some ramen. In 2004, David Chang made the Japanese noodle soup mainstream when he opened his New York ramen shop Momofuku Noodle Bar. Since then, interest in ramen has only grown hotter. Over the years, D.C. has added to its collection of ramen restaurants, which include Toki Underground, Sakuramen and Daikaya, to name a few. But Utagawa says, despite ramen’s popularity, most diners don’t know the details of what they’re eating. “A lot of people know ramen through the ‘three packages for $1’ sort of thing; it got them through college and so on. They develop a taste for it, but they don’t really know what makes real ramen. And we felt that the day we opened,” says Utagawa, who started Daikaya three years ago in D.C.’s Chinatown neighborhood. He and Daikaya chef Katsuya Fukushima decided it was time to start educating diners on the historical, cultural and culinary significance of the noodle soup. So last month they launched one of the city’s most popular summer classes: Sapporo Ramen 101. The one-hour crash course covers everything curious eaters could ever want to know about ramen, including the most common varieties (there are 32 different types of regional ramen in Japan), its core ingredients and the different flavor components of the dish. Utagawa likens the intimate classes, which are limited to 10 students, to touring an art museum with a detailed audio guide. Small bowls of Fukushima’s broth (which takes 18 hours to make) are served both with and without salt so attendees can taste the difference. “Not everybody actually pays attention to what’s happening to their palate or the experience of eating, and when you make them aware of what they are already tasting, or the sensations they have, they understand quicker,” Utagawa says. Students also taste the broth combined with Sapporo ramen’s three different tares, or sauces, and learn about the importance of the noodle, which Utagawa says should be springy, chewy and packed with flavor. Fukushima even offers insight into the ramen toppings, including Daikaya’s famous marinated egg. And while the hour is packed with fun facts, there is one thing Utagawa and Fukushima do not cover, and that is how to make ramen at home. The class is interactive, but it is not intended to be a cooking lesson. Utagawa says if anything, it shows how difficult it is to make ramen from scratch. “The more you understand, the more you realize it’s something you can’t do at home,” he says. That’s not to say attendees can’t satisfy their cravings at Sapporo Ramen 101. The class ends with a big bowl of ramen, so that each student walks away with a full tummy and a new appreciation for the traditional Japanese dish. The next Sapporo Ramen 101 class will take place on Saturday, July 25; additional dates will be announced soon. The cost of each class is $28. More information, including registration, is available on Daikaya’s Facebook page. Hungry for more? Daikaya recently announced its plans to open a second ramen restaurant location in the new mixed-used Atlantic Plumbing development in the U Street/Shaw neighborhood this fall. The team is also opening a chicken ramen and fried Japanese chicken concept around the corner from its Chinatown location in a former Burger King. That restaurant will also open this fall.